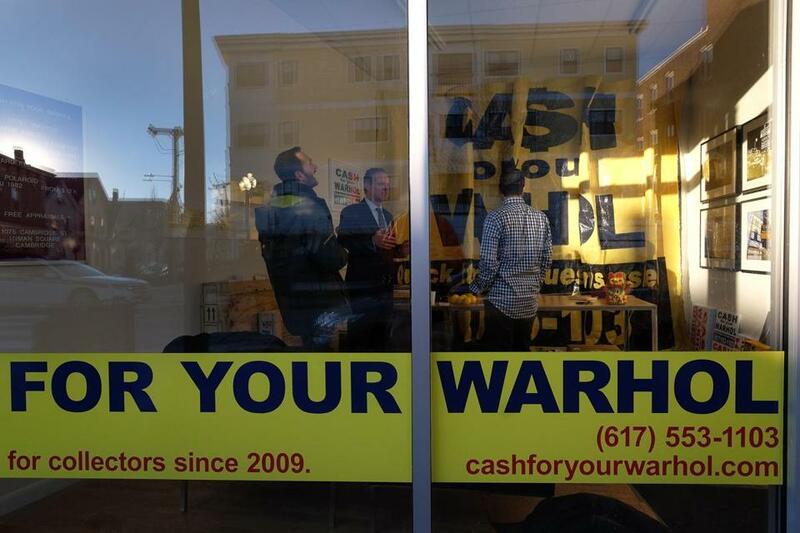 Geoff Hargadon opened “Cash For Your Warhol” in Inman Square. There’s a new store in Cambridge calling for patrons to sell off their Andy Warhol paintings for cold, hard cash. But there’s more to the retail space than meets the eye. The business occupying the storefront isn’t actually paying for pop art. The business is the art. “Cash For Your Warhol,” which opened Sunday at 1075 Cambridge St., in Inman Square, is an extension of a street art installation that first appeared in the form of small outdoor signs in 2009, in the midst of Wall Street’s meltdown. Launched by Somerville resident Geoff Hargadon, the storefront is what he calls a “straight-faced attempt” to take that project in a new direction. There’s more to the retail space than meets the eye. Hargadon was inspired to create “Cash For Your Warhol” during the financial collapse. After seeing posters that screamed “Cash For Your House” hung up on telephone poles, he took a tongue-in-cheek approach to the notion of selling property in hard times to a stranger. Hargadon had yellow signs advertising the purchase of Warhol paintings printed. On the bottom of each sign, he included a phone number that people could call to “sell” their art. The number, which is still active, connects to a Google Voice mailbox where people can leave messages or inquiries. Since the project’s inception, more than 3,000 curious people have called the number. Hargadon said he stores and archives each response. 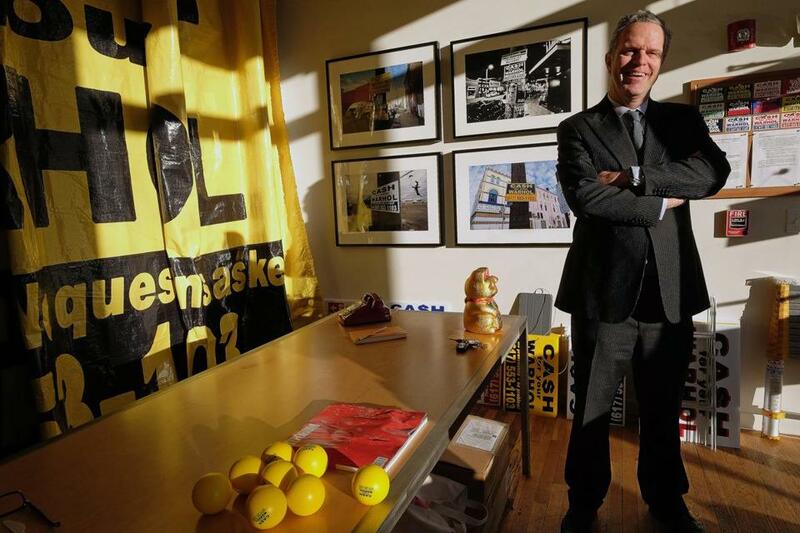 The signs have also been featured in art shows across the country, so opening his own gallery — masked as a retail space — was the logical next move, said Hargadon. The space on Cambridge Street is owned by Clover Food Lab, which operates next door. Restaurateur Ayr Muir rents out the small storefront to artists and business owners looking to host “pop-up” exhibits and sales. Hargadon plans to stay there through February, offering, in jest, to purchase authentic Warhol paintings and prints. From the sidewalk, the store looks like a place to pawn paintings, blending in effortlessly with the row of merchants along the busy avenue. Passersby can peer into the window and view a carefully arranged display. Or, they can stop in during the store’s regular business hours, which Hargadon posts to social media using an unassuming Twitter account, @Cash4YourWarhol, and see the items up close. Inside the space, on a table, are stacks of Warhol reference books. 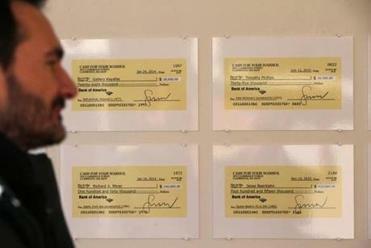 An array of fake checks made out to customers who “sold” their paintings covers a portion of one wall. Across the room from the checks, Hargadon’s signature sign boards rest neatly against the wall. Just beyond the signs, at the back of the store, is a large, yellow banner, which was part of a billboard installation in 2012, draped over a wall. A felt board listing the names of the top Warhol paintings Hargadon is looking to purchase is pinned up near the check display. Warhol’s “Five Deaths Twice” tops the list. “I like that piece. It’s my favorite,” said Hargadon. The only “real” item in the store is a cease and desist letter that Hargadon sent to the owner of the website “CashForYourWarhols.com,” which launched four years after his conceptual art project began. The legal notice is posted on a corkboard that is prominently displayed by the entrance. Hargadon said he is measuring the installation’s success based on how well it blends into the community and convinces observers that it may be real. So far, he said, it’s working. Hargadon said the store seems to be blending into the community.